This is the complete Handbrake tutorial on how to rip DVD with desired quality using the open source Handbrake. Plus, common handbrake errors including no valid source found, libdvdcss error and more are included in the post so that you can better cope with these protected DVDs. How many DVDs do you have in your collection so far? 200, 300, or more? After doing a survey, I found the number of DVDs is beyond my expectation. As a matter of fact, 50% people have collected over 500 DVDs. In addition to awe and envy, you must be more curious about the DVD storage ideas - digitize DVD collection or store them in cabinets? Honestly speaking, finding all kinds of places (bench, bed, shelve, etc) to store DVDs is much more complex than digitizing DVD library. Furthermore, DVD is fragile, easy to be damaged and incompatible with tablets/phones/game consoles. Thus, it is wise for DVD lovers to convert DVD to digital file formats like MP4, AVI, MKV, FLV, or other video formats no matter for storage or later playback. 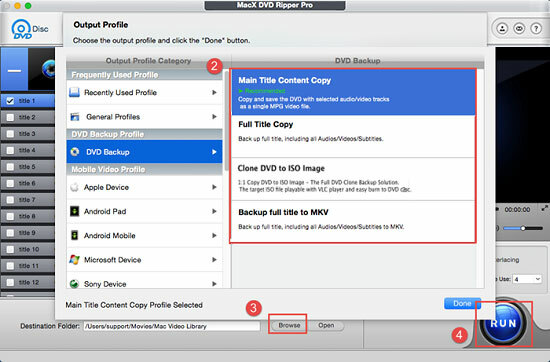 MacX DVD Ripper Pro - a top DVD copying software lets you easily backup your DVD collection and digitize DVD discs to AVI, MP4, H264, MOV, FLV, MPEG4, M4V, etc for later playback on iPhone iPad Android devices. It is able to make 1:1 copy from protected DVD to ISO image or a single MPEG 2 file so that you can store it on computer hard drive & USB, NAS, media server, etc or play it with VLC or Quicktime Player. Most importantly, With the excellent DVD ripper, you can effortlessly rip and copy commercial DVD movies (including damaged DVDs, 99-title DVDs), whether they are all encrypted with CSS, region code, RCE, Sony ArccOS, UOPs, Disney or other DVD copyright protections (Those encryption techniques are commonly adopted by many DVD publishers like Disney, Sony, Paramount, etc.). When DVD digitization is over, you can eventually take advantage of the cover-all MacX MediaTrans to transfer converted DVD movies from Mac to iPhone iPad and more devices for on-the-go watching. Certainly, to transfer photos from Mac to iPhone or sync music, video, iBooks, ringtone, iTunes U, etc. between Mac and iPhone iPad is no-brainer to it, as well. 1. What size of hard drive do you need? Some users worry about the lack of hard drive capacity to store the digital DVD content. Actually, you can calculate your needed space like this: (number of DVDs X 4.3) + (number of blu-rays X 27) = total amount of GB of hard drive space you'll need. This formula is suitable for 1:1 copying DVD without any quality loss, but accordingly, the size of video files will be pretty big. You can also digitize and copy DVD to NAS, cloud, media server etc. for storage and much easier sharing compared with digitizing DVDs to hard drive, USB drive, computer etc. And if you want to digitize DVD collection to smaller size video files, you can choose a smaller-sized file format (MP4, AVI, FLV, etc.) as output format in order to save more storage space and time. Certainly, there is some loss in quality. 2. Is it legal to backup DVD collection for personal use? Different places have different copyright laws in the worldwide. Before ripping & copying DVD collection with DVD ripping software, you should make a detailed research of current copyright laws to ensure it is legal to copy DVDs for personal use. 3. Is there any recommended video playing software to play digital video files? A majority of people will choose computer hard drive to save the converted DVD file during the process of digitizing DVD library. For successfully streaming those files, you are suggested to install proper DVD player on your computer like VLC, 5KPlayer and more. Warm note: although VLC media player is free and widely used, the situation of VLC stuttering such as VLC not playing MKV will occur constantly when playing some uncompressed DVD files. Never mind, find 5KPlayer, KMPlayer or other popular video players as alternative. Step 1: Load DVD Disc. Free download the DVD digitizing software on Mac, hit "DVD" button to import the DVD files after you insert the DVD disc you want to copy. If you are a Windows user, you can download MacX DVD Ripper Pro for Windows. Hit "DVD Backup" button to digitize DVD collection Mac. By the way, this DVD ripper for Mac can automatically chooses the right title for you. In addition to making a copy for DVD collection, you also can directly convert DVD to H.264, DVD to MOV, DVD to MP4, DVD to FLV, etc and portable devices like DVD to iPad, iPhone, iPod, PSP, Xbox 360, HTC, Samsung, etc. Hit the "RUN" button to start ripping DVD disc to digital format on Mac. You can view the backup progress and are able to cancel it at anytime. Notice: We only advocate using this best Mac DVD ripper to digitize DVD collection for legal personal use, instead of illegal reproduction or distribution of copyrighted content. Please obey your local DVD copyright law before doing it. DO NOT do harm to others' lawful rights and interests. One click digitize DVD discs to MP4, MOV, MKV, AVI, and other digital formats at high quality.